In July 2011, François Carrier arrived in London on a six-month residency organised by Conseil des arts et des lettres du Québec. He wasted no time in making himself at home and living like a Londoner, soon becoming a familiar figure at jazz and improvised music gigs. I first met him one evening when I was volunteering at The Vortex, working on the door. “Hi, I’m François. I play alto sax” he said, handing me a copy of his Ayler Records CD Entrance 3 with Bobo Stenson on piano, Pierre Côté on double bass and Michel Lambert on drums. He gave away plenty of copies of his CD that evening and talked to a lot of people, setting a pattern that would persist throughout his stay. In conversation, François proved himself to be infectiously outgoing, optimistic and positive. When speaking, he frequently uses the exclamation “Wow!” which reflects his attitude to the world, namely that it is a place to be discovered and a constant source of awe, wonder and inspiration. Having talked to him on many occasions during his stay, I can honestly say that I never left a conversation with François without feeling better afterwards than before. That same life-force and drive are as obvious in his music as in everything else he does. His stay in London coincided with the release of a trilogy of his albums recorded on a visit to Russia in December 2010, when he played in a trio with Lambert on drums and Russian pianist Alexey Lapin. As with his other releases, the trilogy showed François to be a fluent improviser able to effortlessly spin out satisfying melodic phrases at will. They also demonstrated the empathy he and Lambert share, the kind of understanding that only comes from playing together for years. 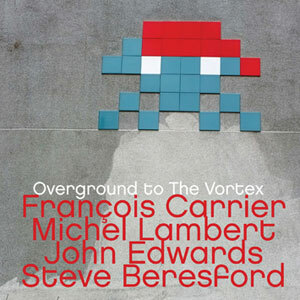 The music on Overground to The Vortex dates from the launch gig for In Motion (the final part of the trilogy), which was held at The Vortex towards the end of François’s stay. Lambert flew over especially for the gig, meaning the evening’s music was a genuine collaboration between Québec and London, with our own John Edwards playing bass and Steve Beresford joining on piano for the second half. There was a buzz in the club that night – François chatted to the crowd and even performed a magic trick between numbers at one point – and the music reflects that infectious atmosphere. At the beginning of January 2012, François flew back to his native Québec leaving those of us who had known him with many happy memories, both personal and musical, plus the hope that he would return soon. London needs him!